For many years, comedian Bill Cosby told jokes about growing up in his family. He once told the story of his strict disciplinarian mother who wielded a stick “like a samurai warrior” when Bill misbehaved and proclaimed, “I brought you into this world, I can take you out!” Now I am not sure how true this story was, but Bill jokingly spoke of a generation of parents who commanded respect and honor from their children through discipline. Bill continues to speak out on this topic today, which has made him adored in some circles and abhorred in others. However, he touches upon a point that many children today do not honor their parents and go on to be adults that do knucklehead things that cause trouble for themselves and others. 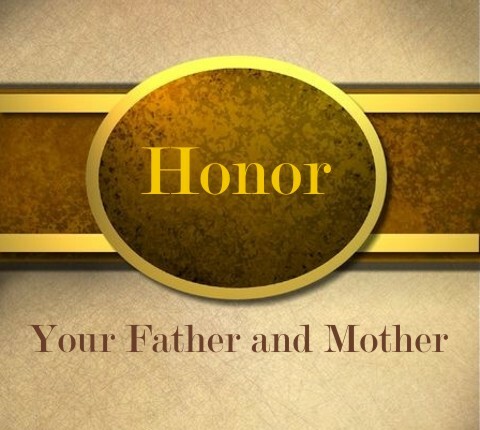 Considering our culture today, a Bible and life application lesson on how to honor your father and mother is needed. What does God say about honoring parents? “Honour thy father and thy mother: that thy days may be long upon the land which the LORD thy God giveth thee.” (Exodus 20:12). Although this commandment seems pretty straight forward, it should be noted that this commandment comes with a promise. The promise is that when you honor your parents, your days may be long upon the land. God must place great importance on honoring parents to have given a promise with it. Why does God make this promise? We see this taught in Ephesians 5:22-33. These verses teach us that the husband is to model Christ first, which enables the wife is to model the church. When the husband and wife put Christ first in their life, they are enabled to demonstrate the love of Christ to their children. This gives children a visible example of how they should behave and act, which makes the parents relationship all the more important and honors God. A man and a woman becomes a family the moment they become married just like believers become part of God’s family the moment they get saved (Galatians 3:26). This means the family comes before the children. This is important because often the troubles in a family stem from the fact the family members have become child centered instead of family centered. Being family centered models how members of the church are to relate to one another (Ephesians 4) and honors God. Children need to learn that mom and dad are ordained by God to lead and guide the family. This means that the parents are in charge and the children are commanded to obey their leadership (Ephesians 6:1-3). When this chain of command is ignored, it leads to disobedience and rebellion, which God condemns as being as evil as witchcraft, which brings about the removal of God’s blessing (1 Samuel 15:22-23; Matthew 15:1-9). Children must also learn they have a part in the family and that they should contribute toward the good of the family. When the focus is on pleasing the child at the expense of the family, it undermines not only the parents, but the whole family. In my experience, child centered families are a living nightmare when the children become teens and often are a great contributor to divorce of the parents. A child who is lovingly taught to honor their parent’s leadership honors God. When children are taught to honor their parents, it teaches them that they are to give honor where honor is due (Romans 13:1-7; 1 Timothy 5:17; 1 Peter 3:7). It teaches a child to be humble and makes them better citizens and it makes for better communities (Proverbs 15:33; Proverbs 18:12; Proverbs 29:23). Children raised in this environment tend to have respect for others and respect for the rule of law (Psalm 78:1-8; 1 Peter 2). A common factor of many prison inmates is the lack of respect for their parents and no father in the home. Giving honor where honor is due honors God. Why are parents to be honored? When parents take the things that they learn and teach them to their children out of love, their children and their children’s children are blessed (Exodus 34:5-7; Deuteronomy 6:4-9; Psalms 103:12-17; Proverbs 22:6; Ephesians 6:4-8). When the children learn to honor their parents out of love they ultimately learn to honor God out of love (Psalms 112; Proverbs 17:7; 1 John 4:19). God wants children to honor their parents because He wants children to see a living example of the relationship between Christ and the church. He wants children to have a firm foundation where parents will raise them in the nurture and admonition of the Lord, recognize their role as a family member, and prepare them to be parents. Finally, God wants children to honor their parents because it teaches them to honor God. Thank you for your article on honoring parents. In my family, when my sister was 13 and pregnant, my parents forced her to have an abortion. My sister is now 54 and I am 53. My sister still struggles with dealing with this abuse. She does not see that she should not have gotten pregnant at 13. My dad still does not see his decision as murder, despite the fact that he has become a Christian since this happened. How does one honour parents that have done this?